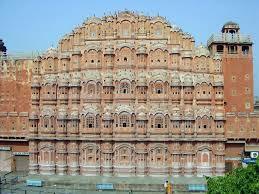 The well-known Palace Of The Winds or Hawa Mahal is one of the attractive tourist spot in Jaipur city, in Rajasthan. Situated in the center of Jaipur, this attractive five-storey complex was built in 1799 by famous Maharaja Sawai Pratap Singh who was the monarch of Kachhwaha Rajput dynasty. The major architect of this palace is made up of red and pink sandstone. This complex had been believed to have been constructed in the form of the coronet of Krishna, the Hindu god. The main person behind construction of this palace was Lal Chand Ustad. It has been considered as an epitome of Rajputana building with key highlight of Hawa Mahal. Hawa Mahal is in pyramid shape and has near about 953 windows (also known as Jharokhas) which are festooned with detailed and unique designs. The foremost purpose behind the edifice of the Mahal was to facilitate the majestic women and present them a vision of day to day life through the windows, as they were not suppose to appear in public. Famous for its distinguished and world-famous architecture, Hawa Mahal was constructed under the regime of Maharaja Sawai Pratap Singh and was designed by Lal Chand Usta. The architecture of Hawa Mahal is undoubtedly an unforgettable sight to behold. Designed as beehive castle with small portholes, Hawa Mahal has a height of 50 feet from its high base. The world-known palace is a five-storey pyramidal shaped monument. The top three floors of the monument have a dimension of one room width. On the rear side of the structure, first and second floors have patios in front of them. The street view of the front elevation of Hawa Mahal resembles a beehive built with small portholes. Further each pothole seems to have small windows beautified with carved sandstone grills, finials and domes. The monument has semi octagonal bays, largely contributing to its exquisite facade. Hawa Mahal is also considered unique for its breathtaking interiors that are known to be embellished with colored marbles, relieved by inlaid panels or gilding. Adding to the scenic view of the Mahal are the fountains adorn the centre of the courtyard.